My Milwaukee Mommy - Lifestyle Mom Blogger Local Family Activities and Saving Money in Milwaukee: Groupon: Peppa Pig Live! Surprise! - Save on Tickets!!!!!!!! 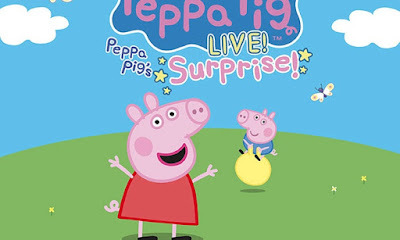 Groupon: Peppa Pig Live! Surprise! - Save on Tickets!!!!!!!! Know any fans of Peppa Pig?!?!? Head over to Groupon where right now you can score deals to Peppa Pig Live! on November 28 at 6 p.m.
Who is Peppa Pig? : The British superstar has her own magazine, television show, and clothing line, and she’s been charming preschoolers and parents alike for more than a decade, jumping in mud puddles, letting out the occasional oink, and winning a BAFTA along the way. How she’ll appear on stage: Peppa’s famously animated, but on stage, she and her family appear as colorful life-sized puppets on two-dimensional backgrounds. What to expect: True to its name, Surprise! will bring about multiple pleasant and unexpected events, but one thing you can be sure of is that there will be plenty of dancing, singing, and games.